First time in ARM history, a CPU planning roadmap was released, showing the performance and power planning of the next two generations of CPU IPs until 2020. 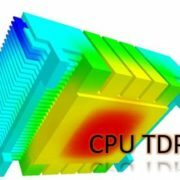 ARM just released a new generation of high-performance CPU core Cortex-A76 in early June, which can be used with 10nm and 7nm processes. Compared to the previous generation, the performance is improved by 35%, energy efficiency is increased by 40%, and machine learning performance is increased by 4 times. 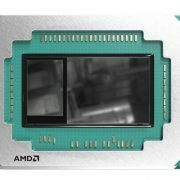 ARM claims that the A76 core has notebook-class performance running 3GHz to compete single-threaded performance of Intel’s low-voltage mobile version of the i5-7300U; also mentioned it consumes less than 5W at 3.3GHz while the Intel’s is turbo-accelerated 3.5GHz, thermal design Consumes 15W. 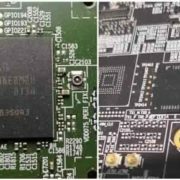 However, the Intel’s’ TPD is official whereas what the ARM claiming is the actual TDP, so it is not a fair game said by the Anandtech. 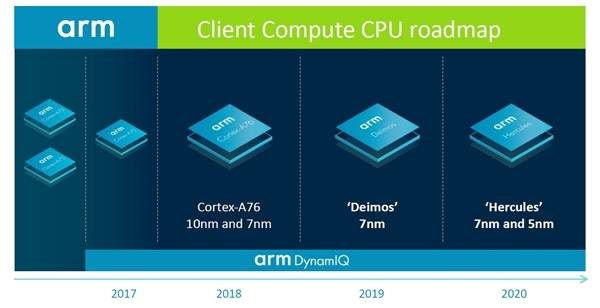 Next year, the ARM will launch a new core ” Deimos ” (the god of fear in Greek mythology), mainly with 7nm, and the next year is another generation of new ” Hercules ” (Hercules in Greek mythology) Can be used with 7nm, 5nm. 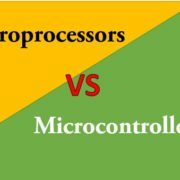 Both are based on the A76 core architecture and continue to dig deeper, claiming that computing performance can be increased by more than 15% per generation. 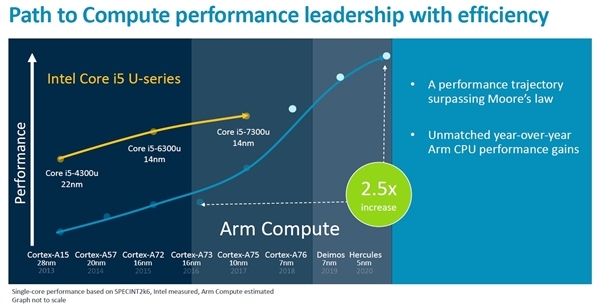 The ARM also claims that the computing performance of the 5nm Hercules core in 2020 can be as much as 2.5 times higher than the 2016 16nm A73, surpassing Moore’s Law and far surpassing Intel. From the graph, the 7nm Deimos would be more impressive than the 7nm A76. It is estimated that at around 20%, the 5nm Hercules will increase whereas 7nm Deimos would around 5%.